This King Arms VLTOR CASV-M CQB weapon is perfect for any job out there. At a comfortable 360 FPS and a range I've yet to confirm is a great starter or experienced players weapon. With its very stylish looks and fully customizeable CASV-M rail system you can mount anything on it, in any direction you want as all the rails can be put on a 45 degree angle. This weapon has a threaded barrel and comes with a sound enhancer pre-attached. 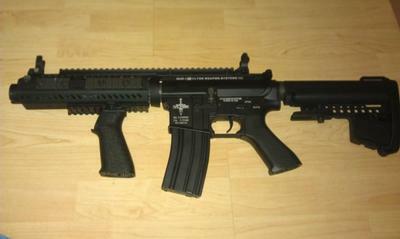 It also includes a stubby tango down grip and a mid cap 300 round full metal mag. The gun itself is full metal, the only plastic parts are the buttsock, pistolgrip and airsoft mag release. The gun is pretty heavy so it does feel like the real thing and has a total of for holes where you can insert a swivle sling mount. The gun also has a great rate of fire and a small kick to it when you fire so you really feel like your using the real thing. Also, with the sound enhancer you can totally bet you will be the loudest person out there when stealth isnt an issue. If stealth is your game then simply screw it off and play away! you dont need something on the end of your barrel, its just for cosmetics and sound dampening. Awesome gun! When you find out more about the range and everything, we'd love a report back!